We’re super excited to introduce our new feature, ScootBoard. ScootBoard is a collaboration tool for teachers and admins to help keep students and parents engaged on ScootPad with features such as 1-way messaging, automatic reminders, and more! Teachers can quickly send 1-way messages to their entire classroom or individual students while Admins can send important messages to all teachers! Have an instructional video or other resources to share with students? Use messages to easily share videos and other resources with just a few clicks! Access your inbox on ScootPad and review all your received messages. 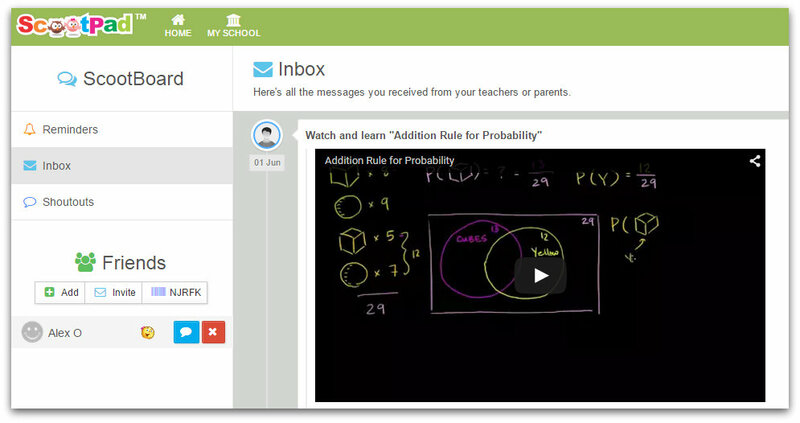 Students can find messages online in their inbox while their parents receive the messages via email! We hope you’re as excited about ScootBoard as we are. Please tell us what you think and keep giving us your feedback and suggestions as always!